Hi everyone. 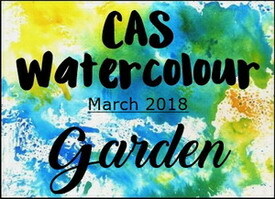 We are already more than half way through the month of March, which means it's time for a reminder post for the CAS Watercolour March Challenge - Garden. I stamped the image in archival ink twice, sloshed on some diluted Disress Inks (Candied Apple for the flowers, Twisted Citron for the leaves). The I took a fine brush and added some blades of grass at the bottom in both Twisted Citron and Mowed Lawn. 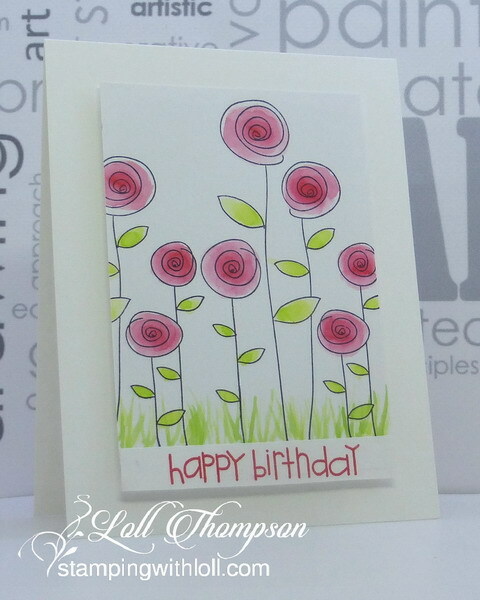 Stamped the sentiment to match the flowers and popped my card front on the base. Easy, peasy and fun. 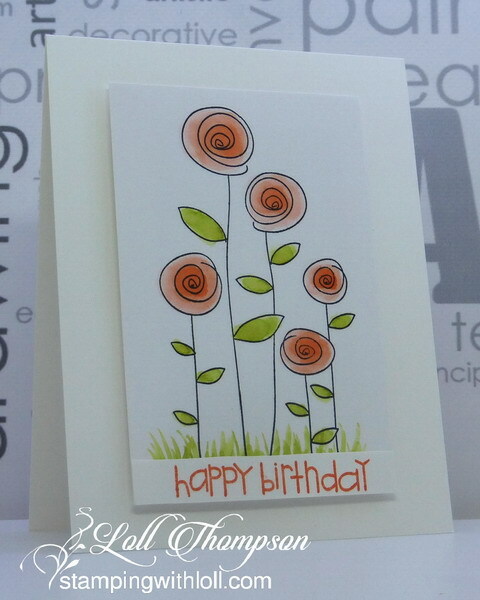 While I was at it ... made a second card using orange for the flower and a darker green for the leaves. This time I only stamped the image once, so it's narrower. Check out the reminder post on CAS Watercolour to see the more inspiring Garden Watercoloured cards from our Designers and wonderful Guest Designer Nonni. Then come play along! Always beautiful cards to visit. Love the simplicity of the roses. What fun funky flowers Loll! So pretty in both colors that you sloshed on! These are just so fun, Loll! Love the colors on both of them. This sure does not look like you sloshed the paint on. It appears controlled and beautifully shaded! Love that image! Love, love, love your flowers gardens, Loll! You "slosh" watercolor beautifully! I'm impressed with your hand painted grass and I love how the sentiment grounds it all! So glad you got out that very old stamp! You created a beautiful flower garden with it! Love both colour variatons. I must take a look at some of my very early stamps! Both are beautiful. You chose some lovely colors to slosh on to the images. Really like this CAS card. So fun when artists feature older stamps that we can all still love to use. Shows they stand the test of time. :) Have a great weekend! Hugs! So simple and simply beautiful, Loll. The doodley flower style works well with the sloshed watercolor. Your garden is so sweet :-) I love modern design thanks to the use of these beautiful stamps. Fun stamp and fun watercoloring! 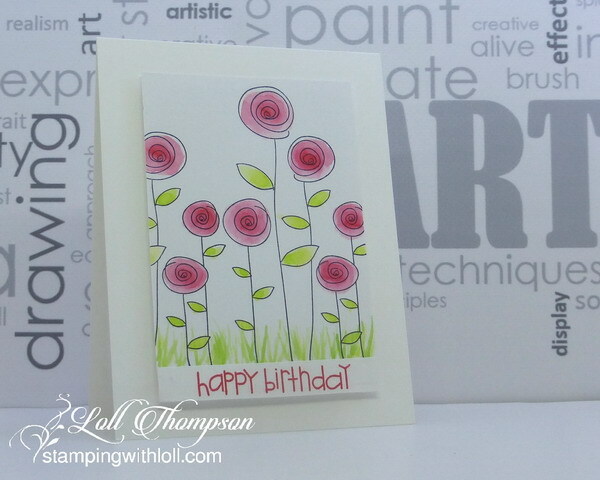 Love the stamp's whimsical style and the sloshy style of watercoloring goes well with it! This is proof that it doesn't have to take hours to make fabulous cards! This is so pretty and fresh feeling mf...just in time for Spring's arrival and I tell you, it can't get here fast enough for me.